Councillor Andrew Burns, Leader of the City of Edinburgh Council, and Councillor Frank McAveety, Leader of Glasgow City Council, have sent a joint letter to Nicola Sturgeon, the First Minister of Scotland, saying the two cities could provide leadership on the issue and were in a position to develop local solutions that could make a difference. Their call made the news, from the Evening Times to Holyrood Magazine. Their call came as the two council leaders met in Glasgow on Friday, 23 October, 2015 to discuss the issue of food poverty during Challenge Poverty Week. They visited a charity in Govan helping provide lunch, advice and support to ex-servicemen and women in the city. They were joined by Councillor Lesley Hinds, chair of Edible Edinburgh, the partnership of organisations working to build new approaches to food in the capital. Councillors McAveety and Burns said a collaborative approach between the Scottish Government and local government could help tackle poverty across the country and called for a meeting on the issue with the First Minister. The said a meeting would be an opportunity to discuss ways of moving beyond food banks to develop responses that contributed to tackling the causes of food poverty. They also want to talk about measures, such as a challenge fund, to promote food hubs as a sustainable and inclusive response that strengthens existing community-led work. Their letter said: “Food poverty is one of the most pressing problems affecting our communities and, in light of the UK Government’s continuing austerity agenda, there is an opportunity for Scotland to develop a distinct response to this challenge. “We believe that, as Scotland’s two biggest cities, Glasgow and Edinburgh are well placed to provide leadership and to develop and implement solutions that work on a local level. Both leaders said it was important to strengthen existing community projects which were leading the way in the fight against food poverty. The Coming Home Centre, based at the A-listed Pearce Institute in Govan, offers veterans support as they adapt to civilian life. Part of this help is to provide a nutritious lunch so that they can catch up with others in the same position and offer peer support in the transition from military to civilian life. During the visit the two leaders helped deliver vegetables grown in Pollok Country Park by Glasgow City Council staff. 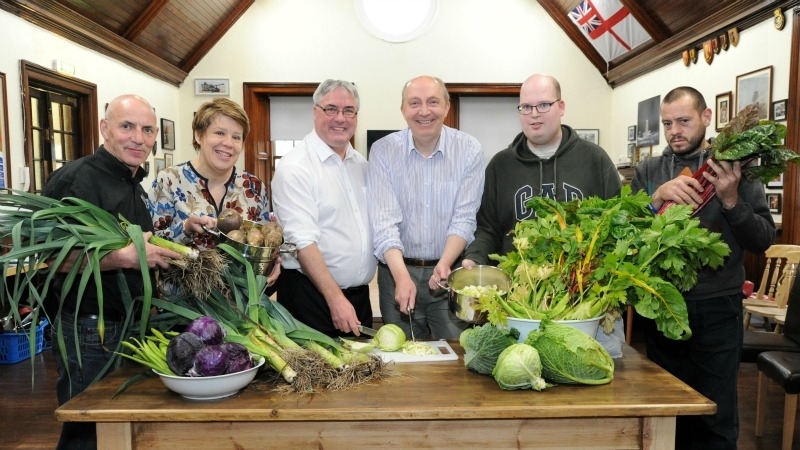 The vegetables were donated to the charity as part of the city’s commitment to becoming a sustainable food city and in support of Glasgow’s Green Year 2015. Both Glasgow and Edinburgh have thriving community food sectors, including food co-operatives, community shops, healthy eating groups and projects, growing projects and community gardens. They are part of the Sustainable Food Cities network, with Edible Edinburgh and the Glasgow Food Policy Partnership working across sectors in their respective cities.